The cedars grew in the high mountains of the Lebanon range, the north-south range along the Mediterranean coast. Cedars also grow in the Amanus mountains north of Antakya, Turkey (Antioch of Syria in Acts 11 and 13). I have seen a small number of cedars still growing in the Taurus Mountains of Turkey. In Lebanon, the most famous of the trees are growing in the high mountains about 100 miles north of Beirut near the town of Besharre, but there are also some growing southeast of Beirut at Barouk. Browsing in Pritchard’s Ancient Near Eastern Texts, I noted numerous reference to ancient rulers cutting cedars and transporting them to built projects in their home country. Tiglath-Pileser I, King of Assyria (1114-1076 B.C. ), says he went to the Lebanon mountains and cut cedar beams for a temple. Ashurnasirpal II, King of Assyria (883-859 B.C. ), says, “I ascended the mountains of the Amamus … and cut down (there) logs of cedars” and other trees. Shalmaneser III, King of Assyria (858-824 B.C. ), claims that he ascended the mountain Amanus and cut cedar and pine timber. Esarhaddon, king of Assyria (680-649 B.C. ), claims he made 22 kings of the Hatti transport material for his palace: “big logs, long beams (and) thin boards from cedar and pine trees, products of the Sirara and Lebanon (La-na-na) mountains which had grown for a long time into tall and strong timber….” Sirara was one of the towns of southern Mesopotamia. Esarhaddon left his image and an inscription on the cliffs above Dog River in Lebanon. The Neo-Babylonian king claims to have rid the country (Lebanon) of a foreign enemy and returned scattered inhabitants to their settlements. In order to transport cedars to Babylon, he explains some of his projects. The Arahtu was a canal built by Nebuchadnezzar near Babylon that was used in the transportation of the cedars. Some of the kings speak of building roads for the transportation of the cedars. In 1971 I was able to make a photo of the inscription left by Nebuchadnezzar at Dog River north of Beirut. Some more recent travelers have found this covered by vines. Click on the photo for a larger image and you will get a better view of some of the cuneiform writing. 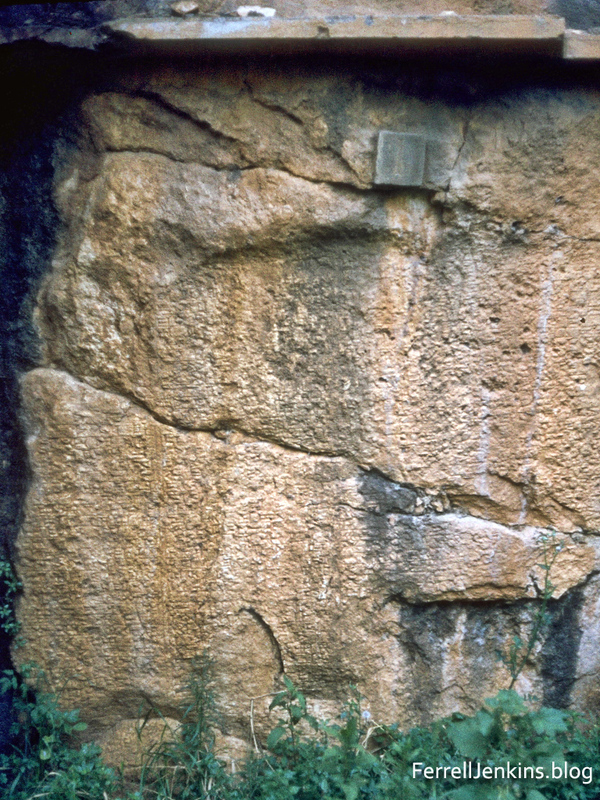 Nebuchadnezzar’s inscription made on the right bank of Dog River in Lebanon. On the left bank on the rock cliffs there are reliefs and inscriptions by Ramses II of Egypt, and Assyrian kings Shalmaneser III (?) and Esarhaddon. Photo by Ferrell Jenkins. Hiram, king of Tyre, promised Solomon that he would transport cedars by sea to Joppa. Transport of the logs along the Palestinian coast south would have involved either tying them together into rafts, which required staying very close to shore for fear of storms breaking them up, or loading them on ships. 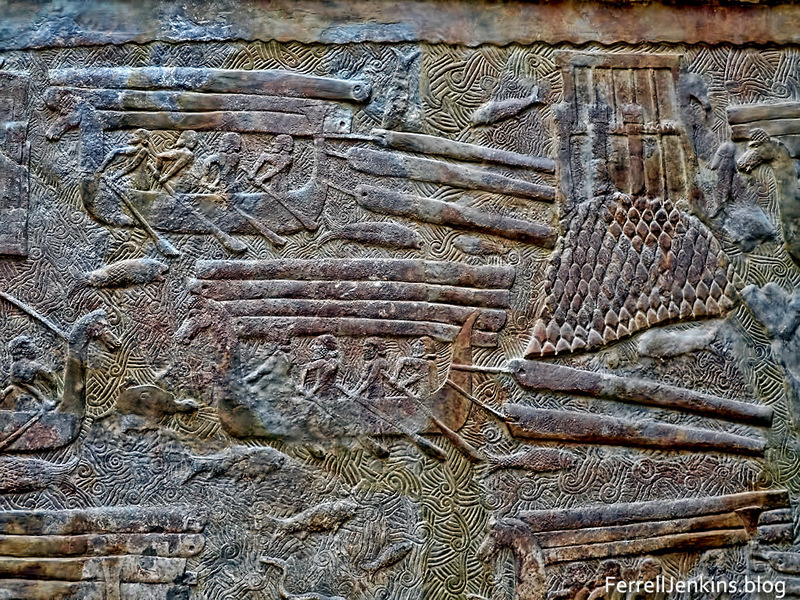 Assyrian reliefs show Phoenician ships both loaded with logs and towing them. This photograph illustrates the comment above, but the biblical text indicates that the logs cut for Solomon were made into rafts. Sargon transporting cedar logs from Lebanon by sea. Displayed in the Louvre. Photo by Ferrell Jenkins. 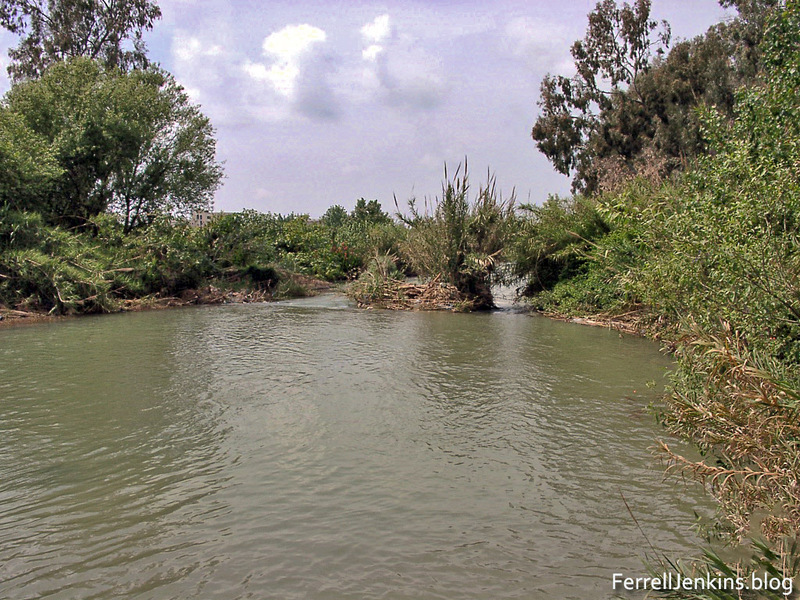 Lebanon had two famous rivers, both of which had their source in the Bekah valley. The Orontes River flowed north past Kadesh, Hamath, and other cities and then turned west to flow past Antioch into the Mediterranean at Seleucia. The Leontes River (also known as the Letani), flowed through the Lebanon mountains and into the Mediterranean a few miles north of Tyre. Since we know of other rulers floating the timbers on rivers, I have thought that perhaps some of those going to Jerusalem may have been moved from the southern forests by means of the Leontes, then tied into rafts near the coast for the trip to Joppa. The Leontes (= Litani) river a few miles north of Tyre, Lebanon. Photo: Ferrell Jenkins. The distance from the mouth of the Leontes River to Joppa is about 95 miles (152 km). 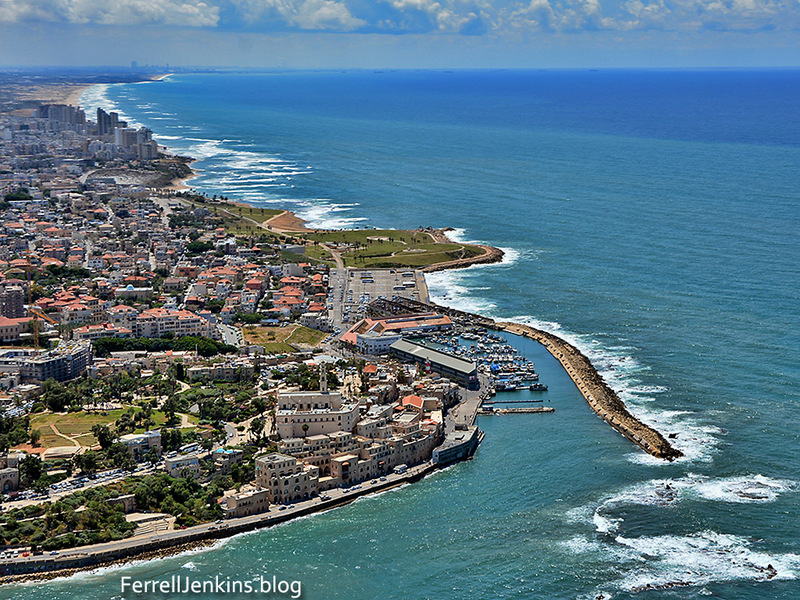 Our photos below is an aerial view of Joppa and its modern harbor. The modern harbor at Joppa. We know that the tel (a green mound with some paths on it) you see in the left bottom quarter of the photo was inhabited by Egyptians as early as the 15th century B.C. Photo by Ferrell Jenkins. Some scholars believe that the port referred to is that of Tell Qasile, east of Jaffa. If that is so, the logs would be floated up the Yarkon River a short distance to Tell Qasile which is a little northeast of Joppa, close enough to be considered Joppa. From Joppa the logs were transported by Solomon’s men across the plain of Sharon and up into the mountains of Judea. Quite a project without trucks or trains. 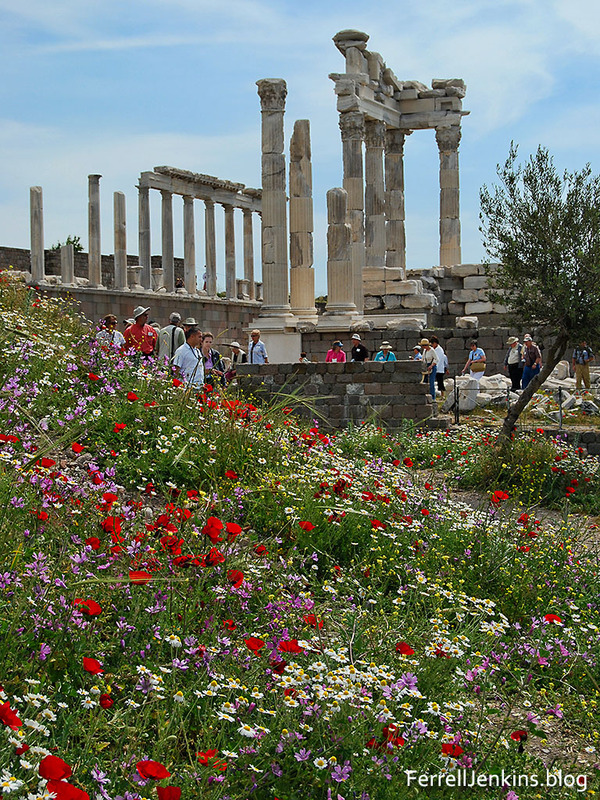 In addition to the temple, the Bible records that Solomon built “the House of the Forest of Lebanon” (I Kings 7:2). Our final photograph shows some stone anchors displayed at Tel Qasile which is located on the grounds of the Eretz Israel Museum in Tel Aviv. 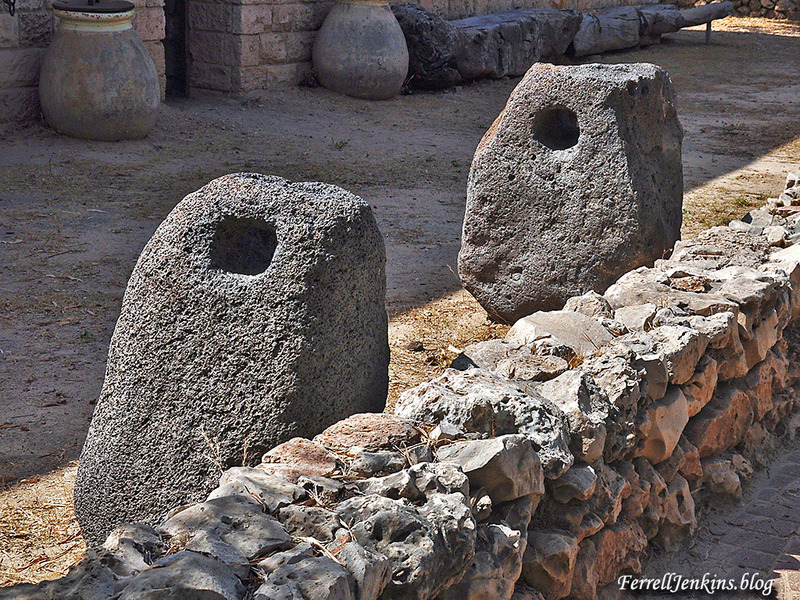 I notice that these are larger than anchors found at the Sea of Galilee. These would be more suitable for use on a river such as the Yarkon. Stone anchors displayed at Tel Qasile at the Eretz Israel Museum, Tel Aviv. Photo by Ferrell Jenkins.